Left to right- Tonya Wimmer (MARS-Dalhousie University), Dr. Megan Jones (CWHC Atlantic -AVC), Jarrett Corke (MARS), Dr. Laura Bourque (CWHC Atlantic), Dr. Dave McRuer (CWHC-Parks Canada) and Darlene Weeks (CWHC Atlantic). 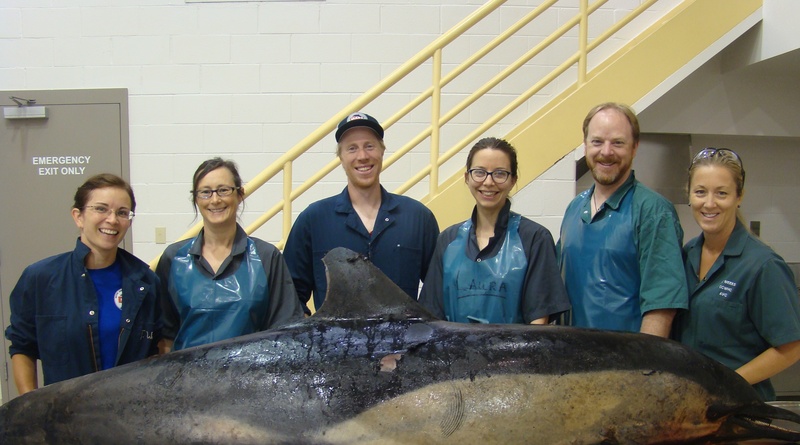 On August 22, 2018, CWHC Atlantic hosted a marine mammal necropsy lab at the Atlantic Veterinary College (AVC), UPEI, for members of the Marine Animal Response Society (MARS) which is based in Halifax, Nova Scotia. MARS is a charitable organization dedicated to marine mammal (whales, dolphins, porpoises, and seals) conservation in the Maritimes through response, research and education. The society, formerly known as the Nova Scotia Stranding Network, was initially established by a group of volunteers in 1990 to monitor and respond to strandings and incidental catches of marine mammals (http://marineanimals.ca/site/). MARS and CWHC Atlantic work very closely together in events involving dead or stranded marine mammals in our region, so this lab was intended as refresher training when a necropsy is necessary. 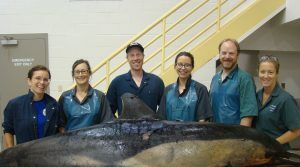 Topics covered included marine mammal anatomy, biology and pathology, and the lab used dolphins and porpoises that had been found dead in the Maritimes and submitted to CWHC Atlantic for necropsy. This type of hands on training is vital to our work and continues to build and improve relationships while working together in the area wildlife health surveillance.